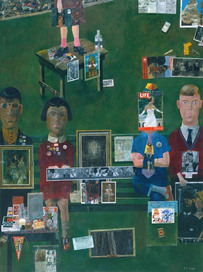 The Tate in Liverpool is set to host a new Peter Blake Retrospective – the largest exhibition of the man’s work since his Tate Gallery shows back in 1983. Although details aren’t fully available as yet, the gallery says that the show will feature a mix of well-known works, along with new and rarely-seen items. The "classics" will include On the Balcony 1955-57 (pictured), The Toy Shop 1962 and inevitably, The Beatles 1963-68. And from the modern era, it will features the project Blake is currently working on – the Marcel Duchamp World Series. It all runs from 29th June to 23rd September 2007, with tickets priced at around £5.